Clutter is an expression of unhappiness. When one’s things are managed in a haphazard way, the first thought should be “What am I unhappy about?” The answers can be surprising. Perhaps the clutter comes from unhappiness about the amount of stuff-too much stuff! Perhaps the clutter comes from unhappiness about obligations—too many obligations to handle. Perhaps the clutter comes from unhappiness about one’s current life presentation (in other words, the form of one’s daily life). Perhaps the clutter comes from unhappiness about having more than one should—guilt over one’s excess gifted existence. Perhaps the clutter comes from unhappiness about past choices made or past indecision. Perhaps the clutter comes from unhappiness about the way in which spiritual .omnipotence meted out one’s circumstances. Clutter is much bigger than it seems. Since the causes are multi-layered, then so too is the cure. Choose one of these cures and if it only addresses parts of your issues, then choose another. Cure #1: Consider your expectations of yourself. Consider your expectations of your past—did you expect too much from your caregivers or from other important people in your life? Forgive the caregivers who were too tired. Forgive yourself for taking on too much. 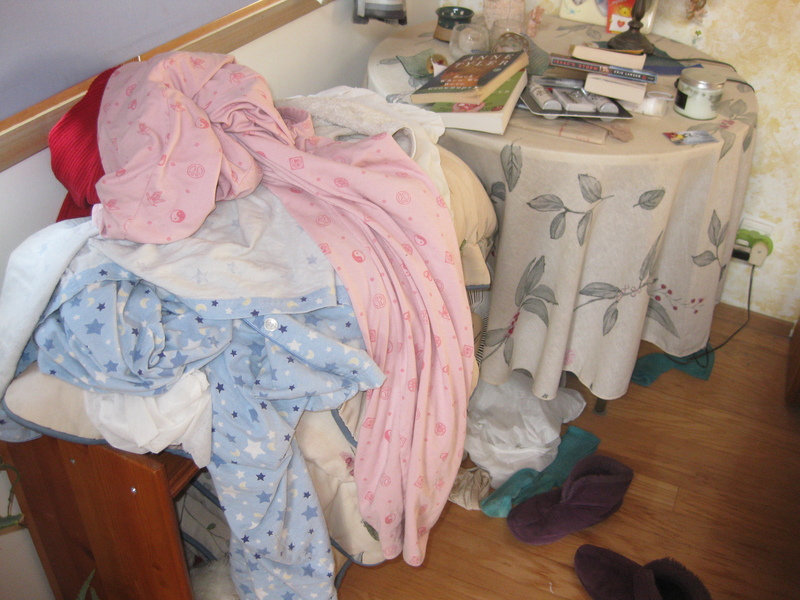 Declutter one significant area, then observe this area and be proud and kind to yourself. Declutter a second significant area, then observe this area and be proud and kind to yourself. Continue in this fashion until you have decluttered the areas that deserve to be uplifting. Cure #2: Write a list of all the choices you have made that have affected your clutter. Examine the list to gain insight. Keep the list in a place where you can see it regularly and address each item by decluttering the corresponding stuff. Continue in this fashion until you have decluttered the areas that deserve to be uplifting. Cure #3: Join a close friend in a decluttering effort. Each of you discuss the choices that have led to your current state of unhappiness. Agree to a decluttering goal and either write it down and sign it or create a decluttering song that you can sing when you declutter your own stuff. Encourage one another. Feel kindly thoughts for the other when he or she succeeds in decluttering. Continue in this fashion until you have decluttered the areas that deserve to be uplifting. In general, people living in modern open societies buy too many things. If you see that you cannot care for the things you own, consider relinquishing many of them. Also, if you find that you are spending a large percentage of your day caring for your possessions so that you are unable to meet with friends or family or are unable to give of your time for helping others, consider relinquishing the possessions that require too much care.